Rats, mice, cockroaches in the house? Rhymer Rigby scans the skirting boards on his tour of duty with Rentokil. I've always had a soft spot for Rentokil. In a world where organisations pour millions into mindless monikers (Centrica, Consignia, anyone? ), this name is a rare piece of honesty. Rent to Kill. I mean, how else are you supposed to deal with vermin? With this in mind, I headed down to Fulham, south-west London, to meet Adam Obee, an area surveyor with the company, and find out how pests are killed. Our first call was a flat shared by two women on an attractive square. One of them had been to India recently and thought she'd brought back cockroaches. A quick inspection showed she probably had. To add to their woes, the duo also had carpet beetles and mice, whose droppings were highly evident around the skirting boards. Mice, Adam said, are pretty incontinent and will drop everywhere, whereas rats prefer a bit of privacy; he prescribed a range of treatments for the unwanted guests. Next up, another flat: mice again. Rentokil insisted on anonymity for its clients, and I can see why. Despite being in one of London's better areas, it looked like it could do with a good clean. We set traps, small plastic boxes with a hole in either side, placed over mouse runs. Inside each was a block of lard, fatally laced with poison. The mouse runs through, stops for a bite - his last supper. Luckily, the fact that the bait is dyed a vibrant blue (to identify it as poisonous) doesn't put the mouse off. Down in the cellar it was a bit Life of Grime, dirty and full of junk. There wasn't room to swing a cat - no wonder there were mice. The lady owner - bless her - seemed to think we could solve all her rodent problems in one visit. But the trouble with old houses is that no matter how many holes you block up, you'll always miss one. And the holes can be tiny. 'If you can get a pen through it, you can get a mouse through it,' said Adam. He advised the client that the best thing she could do was clean out her cellar, which was not so much a mouse motel as a long-stay theme park. Her response suggested that, six months down the line, the cellar would still be full of junk, the mice would be back - and so would Rentokil. Still, it's repeat business. Then came a job at the kind of pretty, million-pound mews house that Americans think all Londoners live in. An equally pretty young woman was complaining of a mysterious smell in the kitchen. Cases like these, said Adam with relish, were a real challenge - there was an investigative component. We poked around and found no evidence of unwanted tenants. By now, I was learning to scan the skirting boards and look under the cupboards for the tell-tale droppings and sundry insect parts. There were none. It was probably the drains. By the time we'd finished, a friend of the client had arrived - and she definitely had mouse problems. 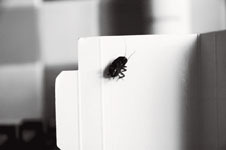 There's a confessional side to pest control. Having mice is a bit of a dirty little secret - You wouldn't blurt it out at a dinner party. But the second someone who understands is there ... well, the floodgates open. With a sympathetic ear and a bit of solidarity, the friend couldn't keep quiet about her own infestation. Adam gave her a card. After lunch (supermarket sandwiches - this job kills your appetite), we cruised over to one of the richest neighbourhoods in the world, inhabited by oligarchs, super-A-listers - and vermin. Infestational creatures are no respecters of wealth, says Adam. You have to hand it to pests: they're deeply democratic. Our stop was an embassy that had bugs in the kitchen: an interesting case of SFI (store food infestation). That is, the merchant grain beetles that were crawling over a tub of rice had probably come in the bag. The pantry was going to need a major clean. After this, we visited a typically upper-middle class home whose resident had a plague of moths in her cashmere cupboard. One last call - mice again - and then back to base. I asked Adam about his weirdest and worst jobs. He said he had had all sorts - spiders from tropical climes, and grey squirrels. His worst job, though, sounded truly disgusting - a 'hygienic clean' of a flat where an alcoholic had died. The flies had alerted the neighbours and Adam remembered seeing a baseball cap on the floor - with some scalp still attached. The smell, he said, stayed with him for days, but this sort of thing was vanishingly rare. By and large, he really enjoyed his work - far more than his previous job as an estate agent. Better, I suppose, to be dealing with rats than to be to thought of as one.